Thanks for resizing. I will pay attention to that with future picture posts. Your images were not re-sized, and I have removed them until they are. I hate to bump old topics, but is there any news about this wonderful behemoth? I'd love to see some new (resized) pictures. Still working on it. Middle gun deck complete. Working on the upper gun deck. If I get a minute, I'll post new photos. Very nice work. Tbh I did not know that the US navy ever sailed any first rates. 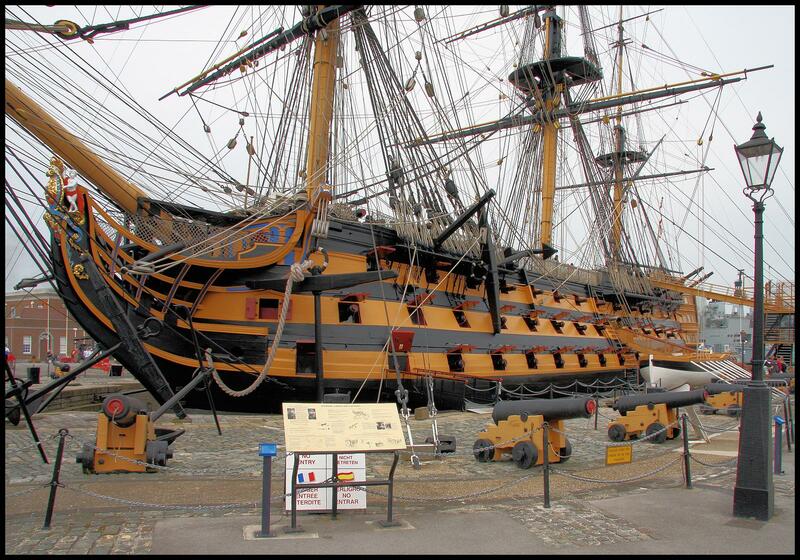 Most of what you read about the early navy concerns the original heavy frigates, Constitution et al. I'll have to do some more reading I guess. Absolutely incredible, quite the undertaking! Here are some new pics. Still working on bow sectino of upper gun deck, then the fitting of that deck. Noticed your "Anatomy of the Ship" book lying on the table. Such great reference books. I have the Bellona and Pandora. Thanks for the close up pics, the detailing is excellent. Are stern chasers on the lower deck accurate? I had always pictured them on the poop deck. Most of what I know of these ships is from reading Aubrey/Maturin over and over and they don't spend much time on first rates. I can't open your photo's but after i read the comments I need to see them! Isn't there any other site where I can see them?? Great ship so far, breathtaking scope, and a wonderful stern hull and gallery! My one slight criticism is in agreement with Perfectionist's comments - the sheer number of guns, which isn't historically accurate. But surely beautiful nonetheless and it might be a purposeful decision. :) I am using 3 wide gunports as well on a project of mine, and they seem to scale well with TLG cannons. 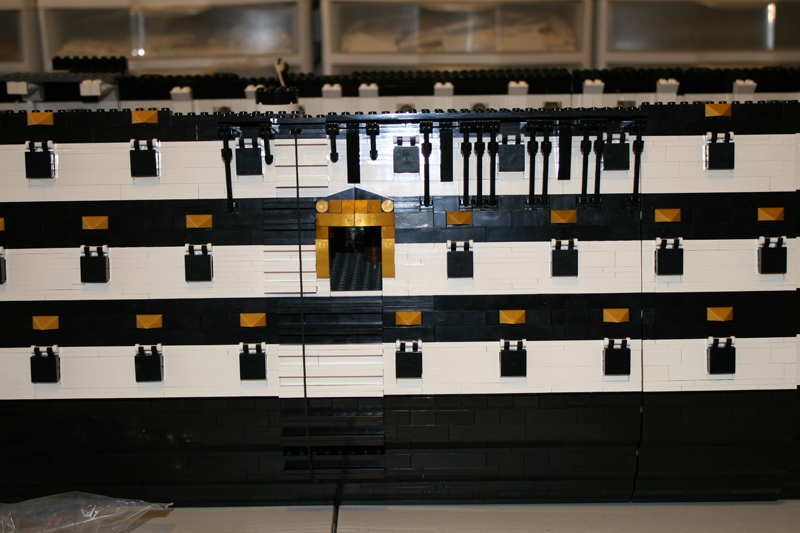 Edit: spacing between gunports on my own ship is 7 studs, which fits a minifig scale third rate, sort of anyway, so I guess if you were inclined to do a bit of reworking on the walls it could come out historically accurate. Did I mention I love the black/white colorscheme? :P Great work! Ships of this size had stern chasers below the gallery. They would often also have guns in the gallery. I left those out so that I could finely detail the gallery. When I laid out the dimensions and scaled the ship's dimensions. I basically added some width and about ten inches in additional length. I was looking for a ship that would have more firepower than any other ship of the time. That is the reason for the number of cannons, although I understand a few historical first rates existed with well over a hundred cannons. However, a few issues come to my mind. In the first place the gunports are not to scale. Check here, the gunports should be almost of the size of windows and they are way too small. Besides this and the wrong number of gunports (which has already been adressed), the bowsprit is also too thick, here. 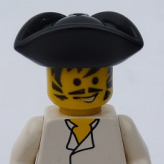 I haven't measured it but I'd say you should have something like 3 studs wide, and not 4 (though IMO 3 studs is even too much, but it is needed because there are no half-stud pieces). Also 150 guns is larger than anything ever built in real life, and even for a forth-decker those 10 extra guns make a difference. I'm looking forward for any updates, this has an enormous potential! Wow, you are making great progress! I love the shape and the looks of the stern, looks really good. Next to other things said, I do think your gunports are a bit small in comparison to everything else, 3x3 ones might look better. 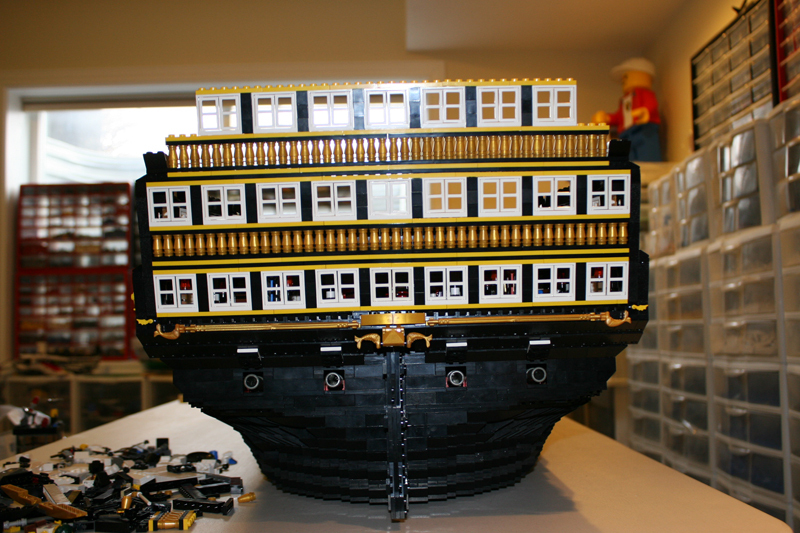 I also think your steps along the middle of the hull are a bit wide, I think 4 studs should really be the maximum. Good luck on finishing up this wonderful behemoth! I don't know of any either, in the time of the super frigates not many first raters were afloat any more anyway I think. Costs were too high and they were rather slow. So I am curious if this is modelled after a real ship, otherwise it is still nice to see one in the US colours! I agree, the bowsprit might be the nicest in 2 studs wide. 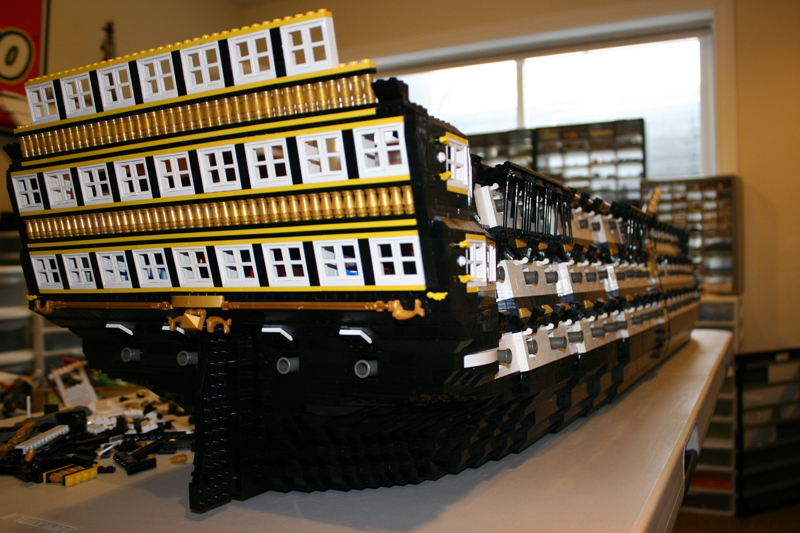 This will also be the thickness I'm using for my Prince Willim VOC ship. 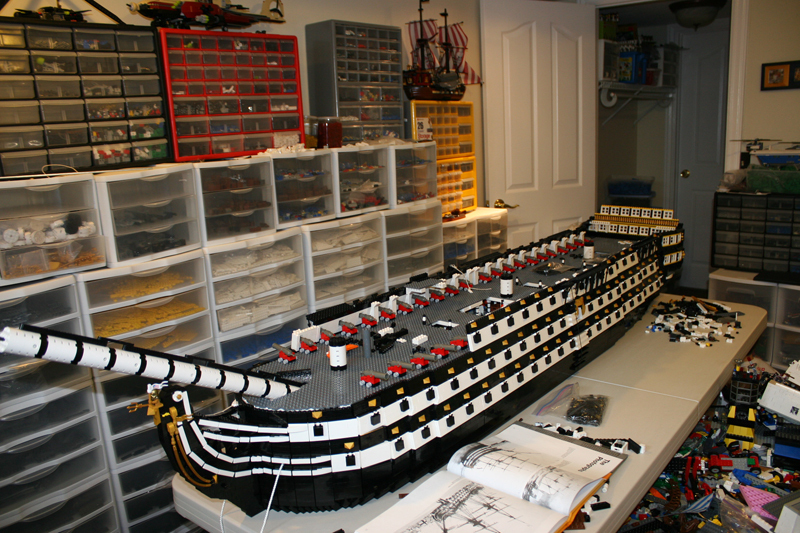 While this isn't the most detailed ship project in minifigure scale and your gun count isn't anywhere realistic, you are actually making some real progress and you've got good chances to be one of the very very few to actually complete such a massive ship model. I've got one question though since she'll become really heavy in the building process: can you still move her? Is the structure stable enough? Still working . . . upper gun deck almost complete. Will update when completed. Upper gun deck almost fitted, will have updated pics shortly. Still a work in progress. 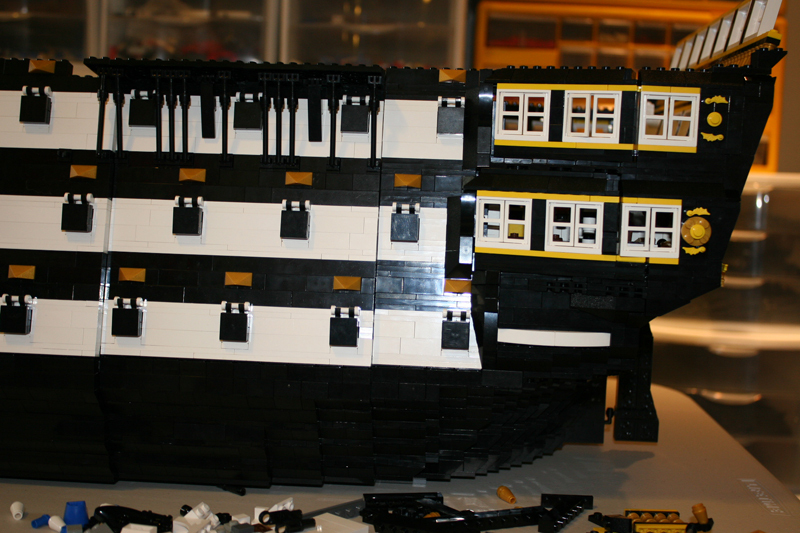 All gun decks complete and working on quarterdeck. That is gigantic! The colors work well together. Do you have all 120+ cannons to fill those ports? With sails, it will have to build up over 2m tall. I know that a build 1m long and 90cm high is difficult to move - like Imperial, I'm interested in how easy it will be to move at that size. Gigantic! Good luck on finishing her! One question, though: Is there any way to convince you to post a WIP shot as a teaser before completion? 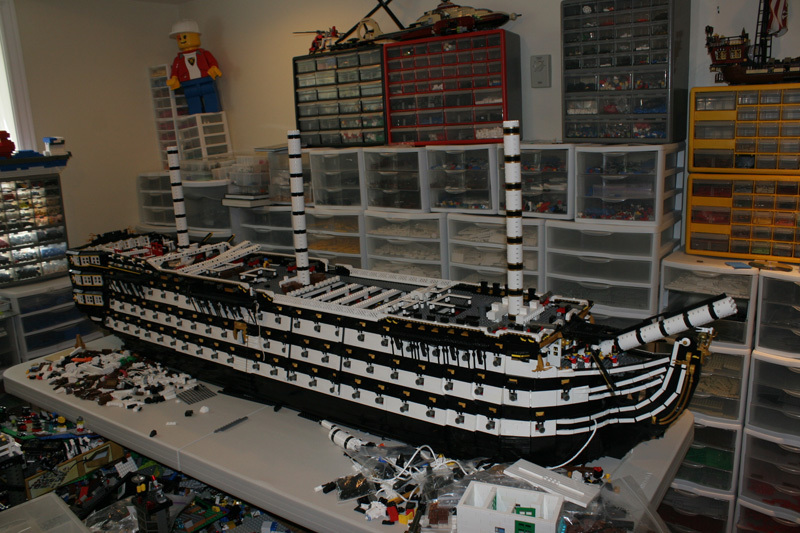 I probably would not have enough bricks to copy this! Cannot wait to see the finished model! In answer to a questions, it is built in three sections, bow, mid, aft. This allows me to move it section by section. But, they are getting really heavy. Not sure how this will work out with rigging. Every cannon port, both the closed and open has a cannon - over 150 cannons. While obviously a fictional ship, I wanted the biggest minifig scale first rate ship one could realistically imagine every being built. This is absolutely mind-boggling! The sheer size is enough to impress but the level of details takes this to a new dimension! An insane project that so far has been extremly well done! Forgot to mention, the rudder works. Turn the ship's wheel on the main deck and it moves back and forth. 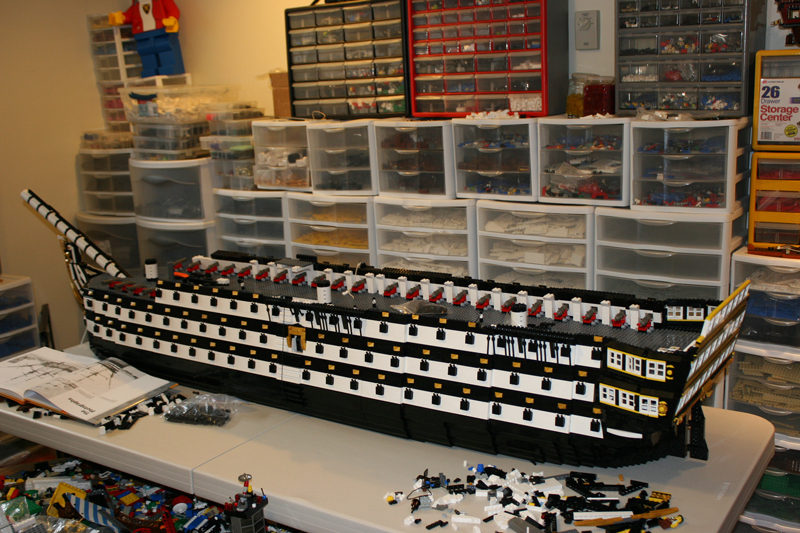 Also, over 300 minifigs already in the ship. Wowwwwwwww! I have never seen such a big ship so far completed! You must be rich to afford all the parts and retired to have the time to build such a monster creation!